The New York Society of Etchers 3rd National Intaglio Exhibition, held at New York City’s National Arts Club, concluded last month after another beautifully executed opening and show. The opening was an elegant event, well-attended by artists and art-lovers alike, in the vibrant National Arts Club gallery. WPG Artist Member Matina Marki Tillman was one of the artists selected for the exhibition, and attended the opening. Dr. Leonard Moss and Dr. Muriel Moss, founding members of the Print Club of New York, curated the exhibition which showcased an outstanding collection of drypoints, etchings, mezzotints, solarplate etchings, and more. Matina’s work featured in the exhibition was from a series of direct etchings of charcoal drawings onto solarplates, several of which are currently on display in WPG’s “Distant Voices” six-member exhibition. This exhibition will run through the month of July in WPG’s main gallery. Ooooh, remember the Art Babble pressure + ink video we linked to last week on lithography? They have one for intaglio and for relief printing, too! They’re shorter than the litho video, but you can still see the materials and differences. Enjoy! WPG artist member Max-Karl Winkler will be teaching an 8-week Relief Printmaking class at the Smithsonian, beginning Thursday 24 January. This class meets once a week for 2 1/2 hours, and is held at the Ripley Center (easily accessible by Metro). 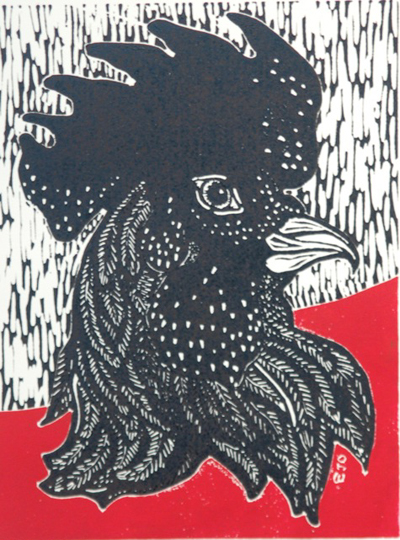 Students will design their own prints, carve both linoleum and wood blocks, learn one-color and two-color printing techniques, and print (without a press) their work. This course is offered through The Smithsonian Associates; further description and enrollment forms (for this and other studio arts classes) can be found on-line at their class website. 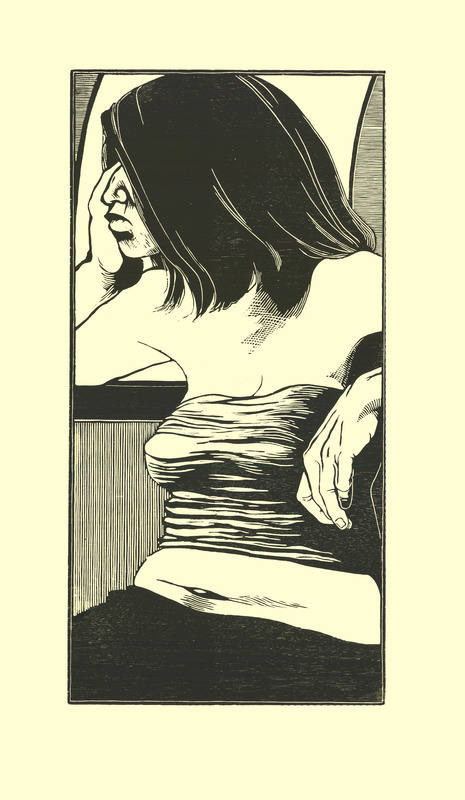 Like any piece of art, a white-line woodcut print begins with an idea. Using the natural world as inspiration, I create a drawing on paper. 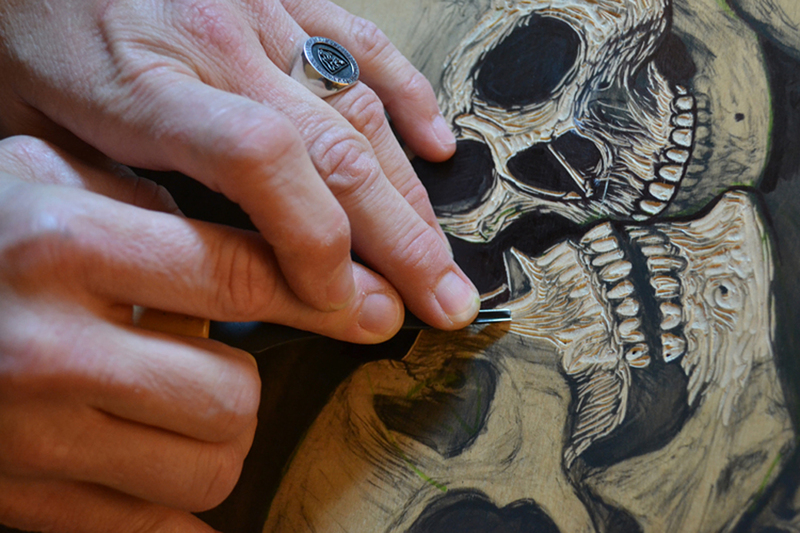 This drawing is then transferred onto a piece of wood. With my lines visible on the surface, I carve an outline of the drawing with a knife. The carved lines will become the “white-lines” in the final print. When I am satisfied with the image, I remove the paper from the block and get ready for the next print. The block can be printed several times, but no two will ever really be alike, so each piece becomes a combination of print and original painting. We’ve discussed the difference between a wood engraving and a woodcut and also a woodcut sub-media, color reduction woodcut. With Hannah Phelps’ plein air to print exhibition coming up next month, we want you to know a little bit more about what you’re looking at. 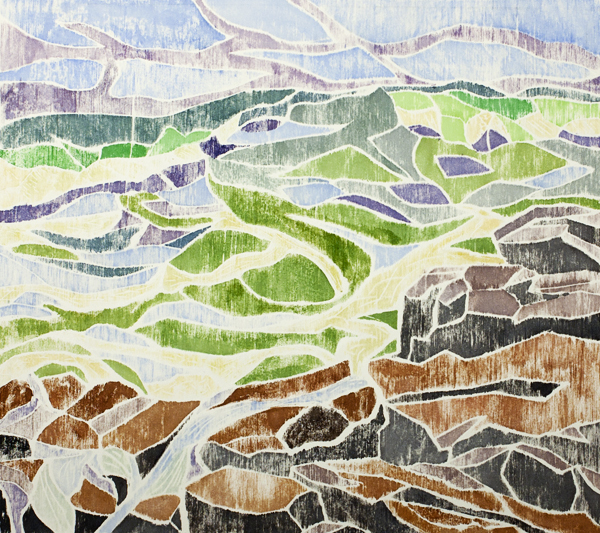 “Path of the Water” by Hannah Phelps, White-line woodcut, 2009. Hannah has two woodcut sub-media in her exhibition. The first is a white-line woodcut. White-line woodcuts are characterized by exactly what it sounds like: a white outline surrounding each shape of color. These lines are carved into the wood using woodcut tools. Then, the individual shapes are inked one by one using different colors (Hannah actually paints hers with watercolors) and run through a press or rubbed with a spoon onto the paper, like a regular woodcut. The “streaky” quality of the image above is actually the natural wood grain of the block. 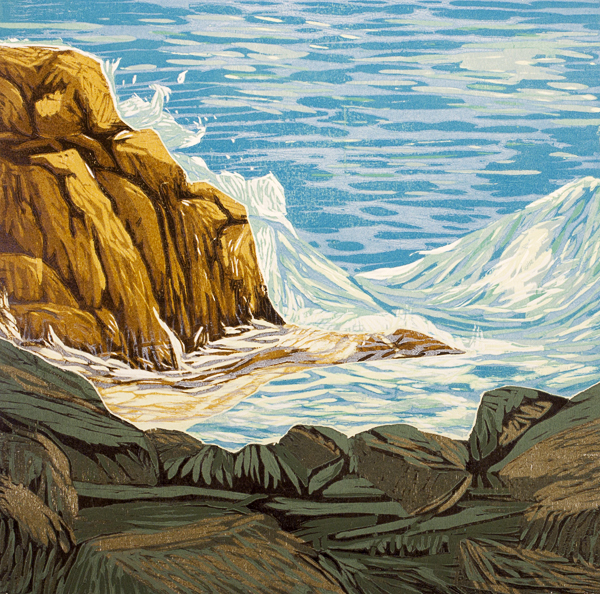 “Private Wave” by Hannah Phelps, jigsaw reduction woodcut, 2012. Jigsaw woodcuts are made from completely separate blocks of wood. Each shape corresponding to a color is cut out, usually using a jigsaw, and put together like a puzzle after each piece is inked, usually into a mold to hold all the pieces together. Depending upon the artists’ intention and how tight the pieces fit together, jigsaw woodcuts can also have a bit of a white outline between color shapes, but it won’t be as pronounced as a true white-line woodcut. The print to above also has some uses some reduction. 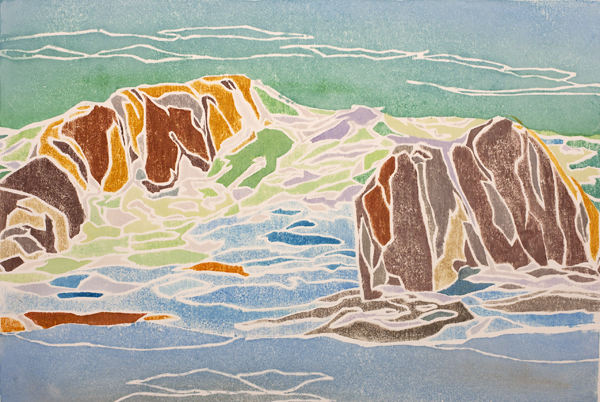 Without seeing the plate, we’d guess there were 4-6 main color shapes–perhaps the foreground, back cliffs, water, and sky, that were each printed and then re-carved to get some of the darker colors. Some of Ed McCluney’s woodcuts are also jigsaw woodcuts (see his chicken, Ernesto, at left, which was printed using two jigsaw pieces). As you can see, there’s a lot of aesthetic variety within this media! 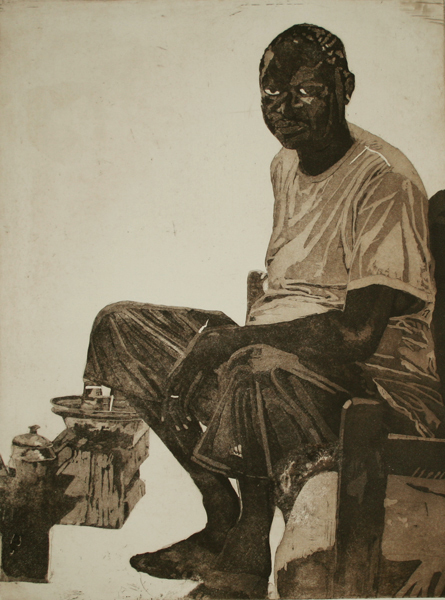 Here is a quick slideshow of some of the work up in the gallery this month from Three Figurative Printmakers as well as Eric Robinson’s Press Room Mini Solo, Fragments. This is by no means exhaustive–Eric has over 600 small prints up, Three Figurative Printmakers has 47 prints, and then there’s the member show as well, not pictured here. Come in and visit us!